If you had to choose a single light shaping tool, you might do well to pick an Impact 7' Parabolic Umbrella. Each of the 3 versions has its attributes and benefits, so which should you choose? Well, now you don't have to; this Impact 7' Parabolic 3 Umbrella Kit has them all - white interior with black backing, silver interior with black backing and white translucent. What all of them have in common is that they're really huge, broad light sources that wrap light around your subject yielding clean highlights and rich open shadows. Due to the special shape of the umbrellas there's a unique mix of soft enveloping light with the kind of crisp detail you only get from reflectors. The fixed black backing on the white/black version ensures that all of the light output is on your subject instead of through the umbrella. You can also vary the light-to-umbrella distance along the shaft for a harder or softer look or for longer throw capability. The silver interior version provides a more specular and contrasty look than the white umbrella. Again, you can also vary the light-to-umbrella distance along the shaft for a harder or softer light. This silver version is ideal for throwing the light over a long distance. Two of them, for instance could light an entire auditorium or a large graduating class. The white translucent version of this umbrella yields the softest light. Used in standard bounce mode, some of the light escapes through the material, slightly raising the ambient light level and lowering contrast while most of it is directed towards your subject. If you want a harder light, turn the umbrella around and aim the convex side at your subject and punch your light source through it. If you had to choose a single light shaping tool, you might do well to pick the silver Impact 7' Parabolic Umbrella. First of all, it's a huge broad light source that wraps light around your subject, yielding clean highlights and rich open shadows. But due to the special shape of the umbrella there's a unique mix of soft enveloping light with the kind of crisp detail you only get from reflectors. Put another way, if you combined a beauty dish with a softbox, you'd have a parabolic umbrella. This umbrella has a unique structural design as well. The shaft is reinforced for strength and instead of bendable metal, the 16 inner ribs are made of durable fiberglass. The fixed black backing ensures that all of the light output is bounced back to your subject instead of through the umbrella. The silver interior provides a more specular and contrasty look than a white umbrella. You can also vary the light-to-umbrella distance along the shaft for a harder or softer light. In addition, an optional diffuser is available for this umbrella, which effectively converts it to a large softbox with just a 1/2 stop loss of output. This silver version is ideal for throwing the light over a long distance. Two of them, for instance, could light an entire auditorium or a large graduating class. The umbrella features an improved finger-friendly locking mechanism for secure and fast set up and break down. Improved locking mechanism provides fast, secure, and "finger-friendly" set up and break down. The parabolic shape produces a more natural wraparound light than a regular umbrella. This soft and natural light is what makes this umbrella a favorite of wedding and portrait photographers. The 7-foot diameter ensures a soft light quality. This umbrella produces enough light for stunning group photos. It will also emit a broad enough beam for full-length portraits. A highly reflective silver ripstop nylon lines the umbrella's interior. It produces maximum light output that's great for studio or outdoor shooting where more contrast or specular highlights are wanted. Often used by fashion photographers for its punchy light. For an umbrella to be effective, it needs to maintain its shape, and the fabric should remain taut. The umbrella features a 16-rib design that maintains the shape of the umbrella and the tension of the fabric for an even light spread. If you had to choose a single light shaping tool, you might do well to pick the Impact 7' Parabolic Umbrella in translucent white. First of all, it's a huge broad light source that wraps light around your subject, yielding clean highlights and rich open shadows. 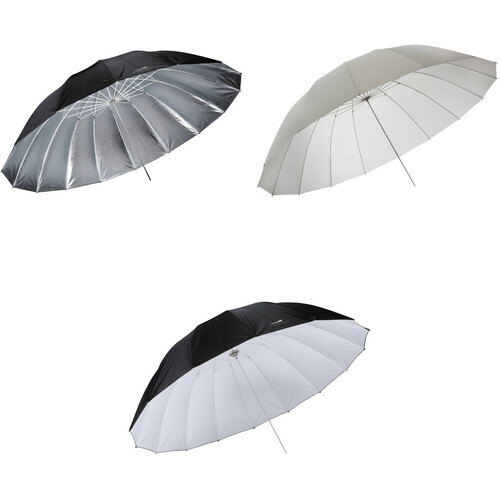 But due to the special shape of the umbrella there's a unique mix of soft enveloping light with the kind of crisp detail you only get from reflectors. Put another way, if you combined a beauty dish with a softbox, you'd have a parabolic umbrella. This umbrella has a unique structural design as well. Instead of bendable metal, the 16 inner ribs are made of durable fiberglass. The improved "finger-friendly" locking mechanism means you won't pinch your fingers when you're setting up or breaking down. The translucent white umbrella's fabric can be used in the traditional bounce mode, or for slightly snappier contrast and a low-ceiling-friendly smaller form factor, you can turn the umbrella around, aim the convex side of it at your subject, and "shoot through" by pumping the light source through the fabric. In addition, an optional diffuser is available for this umbrella, which effectively converts it to a large softbox with just a 1/2 stop loss of output. The improved "finger-friendly" locking mechanism means you won't pinch your fingers when you're setting up or breaking down. When used as a shoot-through umbrella, the translucent white fabric softens and broadens light from your flash and provides you with a seamless and natural-looking light for your subjects. If you had to choose a single light shaping tool, you might do well to pick the Impact 7' Improved Parabolic Umbrella with a black exterior and a white interior. First of all, it's a huge broad light source that wraps light around your subject, yielding clean highlights and rich open shadows. But due to the special shape of the umbrella there's a unique mix of soft enveloping light with the kind of crisp detail you only get from reflectors. Put another way, if you combined a beauty dish with a softbox, you'd have a parabolic umbrella. This umbrella has a unique structural design as well. Instead of bendable metal, the 16 inner ribs are made of durable fiberglass. The fixed black backing ensures that all of the light output is bounced back on your subject instead of through the umbrella. You can also vary the light-to-umbrella distance along the shaft for a harder or softer look, or for longer throw capability. In addition, an optional diffuser is available for this umbrella, which effectively converts it to a large softbox with just a 1/2 stop loss of output. The umbrella features an improved finger-friendly locking mechanism for secure and fast set up and break down. Improved locking mechanism provides fast and secure and "finger-friendly" set up and break down. The white interior produces a broad light that delivers an even throw, which is perfect for portraits and groups. The soft quality of the light is great for creamy skin tones. The black backing efficiently eliminates back spill so light isn't lost when bouncing the beam toward your subject. Box Dimensions (LxWxH) 45.5 x 3.75 x 3.75"
Box Dimensions (LxWxH) 45.5 x 4.0 x 3.75"
Box Dimensions (LxWxH) 45.2 x 4.0 x 3.1"
7' Parabolic 3 Umbrella Kit is rated 4.8 out of 5 by 4. Rated 5 out of 5 by Bryan from Shoot through beauty! There was a challenge about how great lighting could be and though a shoot through umbrella. I took the challenge and used a 7' shoot through and a 600w mono light to for a group of young dancers. The umbrella worked perfectly. It's the only light used and this shot was taken with a APS-C sensored camera with 24-70mm lens @ 24mm, 1/250s, f10 strobe @ 1/1. Rated 4 out of 5 by Amber from Great Kit at a Great Price Having all three types of parabolic umbrellas in my studio allows me different qualities of light with an easy set up (just open like a normal umbrella). The construction seems sturdy and they close down to much smaller than imagined so storage is a breeze! Rated 5 out of 5 by antellez62 from highly recommended if you are a photographer and want soft lights this option is excellent .. highly recommended.